So our little secret is finally out - we’re expecting baby #2 in the fall! This was a lot harder to hide, and I mean physically hide. Since it’s my second time around, my belly started popping out pretty much as soon as the test came back positive and I’ve been living in leggings and maternity pants for months already! 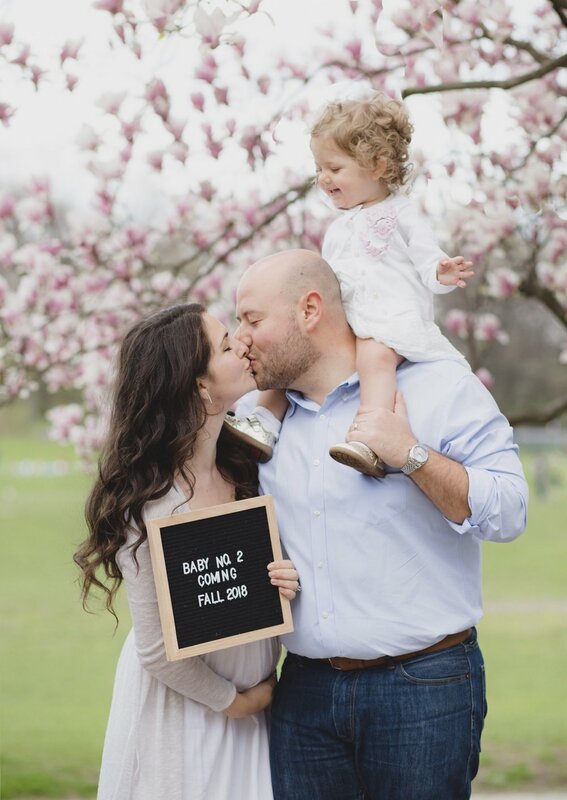 It’s been fun to keep the news between Michael and our families up until now, but it also felt amazing to be able to share our excitement with my online family - YOU! Adina obviously doesn’t understand what’s going on but I know she will be a great big sister. She absolutely loves kids and has two baby dolls that she plays with, snuggles, and loves on. She’s also kind of rough with them, throwing them on the ground and abandoning them in the street, so I’m hopeful she’s a bit more gentle with her baby brother or sister. Adina and the baby will be exactly 24 months apart in age, and I can’t wait to watch them play together when the baby gets older. I got a whole bunch of questions so I thought I’d answer them in a blog post. Due Date: October 28 (exactly 2 days AFTER Adina’s 2nd birthday!) I’m 17 weeks pregnant now. How have I been feeling? Overall, I’ve been feeling pretty much like myself! I’m so thankful that I only had a little bit of nausea/morning sickness during my first trimester. I have been feeling super tired and fatigued though, which I’m sure is a combination of pregnancy and chasing around a 1.5 year old all day long! I need to remind myself to drink more water now that the temperatures are rising and to slow down, which is tough for someone like me who loves bing on-the-go all the time. Do we know the gender? We didn’t find out last time until Adina was born and it was such a surprise to us, since everyone (us included) was convinced we were going to have a boy. This time around I think we do want to find out, so we can begin talking to Adina about her new baby sister/brother and feel a bit more prepared. I’ll be happy either way! I am ver close in age to my sister and Michael is less than 2 years apart from his sister. The sibling bond is so special! Wearing maternity clothes: As I mentioned earlier, I started showing much earlier during this pregnancy and realized I couldn’t zip up my non-maternity pants pretty soon after I got pregnant. I was putting off wearing maternity clothes for a while and was just wearing this belly band over my pants but luckily with the warmer weather we’ve been having lately, I’ve been staying comfortable in flowy shirts and maxi dresses most days. Photographer: Anna McClellan Photography Anna took Adina’s 1st birthday party pictures and this Valentine’s Day shoot. I love working with her! Check out her instagram and facebook page.